Reported by char_haidley@ipsd.org on 4/12/19. 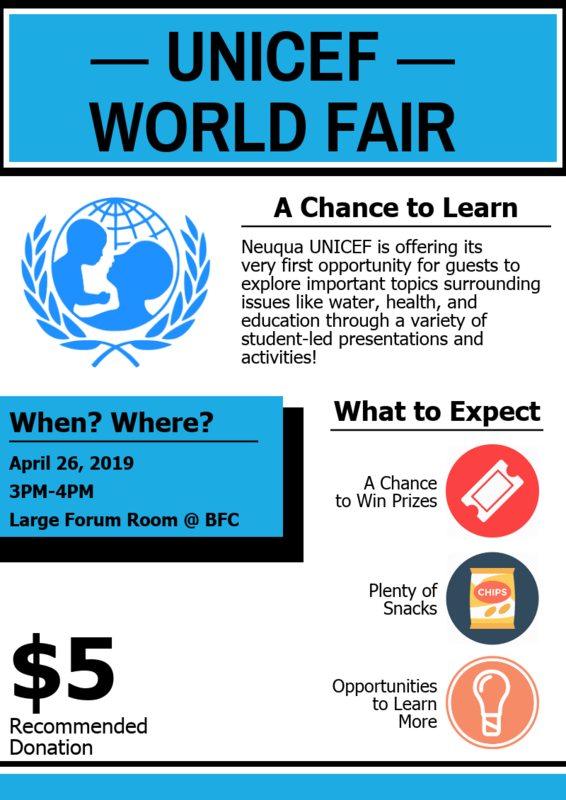 Neuqua UNICEF is offering its very first opportunity for guests to explore important topics surrounding issues like water, health, and education through a variety of student-led presentations and activities! Come join us April 26th at 3:00 PM to 4:00 PM in the Large Forum Room at the Birkett Freshman Center to learn more about pressing issues affecting our global community. As an organization, UNICEF will raise awareness about these issues and allow for direct opportunities for people to help those in need. A suggested donations to UNICEF will give attendees an opportunity to make a difference and show support! Games, raffle prizes, and food will all be available during the event, so we hope to see you there!